HARLEY-Davidson’s CVO Pro Street Breakout is one very special limited edition motorcycle – from its lustrous paint, drag-race inspired styling, super-fat rear tyre and fastidious attention to detail. It’s none of those things which caught my eye when I first saw the Pro Street Breakout though – it was the air filter, a massive Screaming Eagle pod mounted between the massive cylinders and pointing toward the finish line, a quarter mile away. None of the painted oval or round cans with a conventional filter hidden away inside for the Pro Street Breakout, this bike is serious about performance, with incredible torque developed right off the bottom of the rev range. The bike is Harley’s take on custom American muscle – a machine which can match its high performance looks with high performance grunt. Move in closer to the CVO Pro Street Breakout and you start to notice the details, like the headlight cowl and bellypan scoop, styling details which come from the drag bike world. The ‘Smoked Satin’ handlebars are very much drag-race inspired, and they combine with the forward controls to provide a comfortable, aggressive riding position. From that riding position you’ll notice a pair of braided steel lines running from mid-tank forward and over, presumably to free up space under the tank so the designers could get it closer to the engine, which looks better. Above the tubes is the single instrument pod with an analogue speedo and selectable LCD readouts – trip, ODO, time, that sort of thing. You control the instruments through one of the chunky buttons on the left switchblock, which also houses the cruise control selector, another standard feature of the CVO Pro Street Breakout. The right hand switchblock starts the bike and controls the Keyless Ignition – the key fob can stay in your pocket, and flipping the kill switch to off kills the ignition, too, but not the steering lock – for that you need the flip-out circular key built into the key fob. What you won’t see coming from the switchblock is a throttle cable, for Harley’s engineers have dumped that in favor of an electronic ride-by-wire system. Harley-Davidson’s alarm system is in place and disarms automatically if you’re nice and close with the key handy. Under the tank is Harley-Davidson’s Screaming Eagle Twin-Cam 110B motor – the most powerful air-cooled engine ever fitted to a production Harley. At 1801cc (110 cubic inches), it’s a very big V-Twin, and with 101mm pistons going up and down between your legs you know this is one serious machine. Harley-Davidson doesn’t quote power figures, but the company claims 151Nm of torque – 21Nm more than the standard Breakout and 36 more than the V-Rod muscle, two machines renown for their grunt. However you want to describe it, there will be a smile on your face every time you nail the throttle and rocket off toward the horizon. Harley-Davidson works really, really hard to make its bikes sound as good as they can and still pass the draconian Australian noise laws, so the biggest problem with the sound of the CVO Pro Street Breakout is it’s too quiet, there’s no doubt owners and their dealers will be able to release a few decibels to make the audio experience of the Pro Street Breakout as good as the styling. There’s modern technology inside the 6-Speed Cruise Drive transmission, too. Firstly there’s the light-pull hydraulic slipper clutch, which is easy to use and reduces the propensity of the fat back tyre to lock if you’re aggressive on the gear lever and lazy on the clutch. The ’box itself is as loud and clunky as all modern big-bore Harleys, but we never missed a shift. Final drive is by toothed belt. From the Speed Screen to the Blunt-Cut Mufflers, the designers put a lot of effort into making the Pro Street Breakout epitomise American muscle. The machine is available in two colour schemes – the Starfire Black version we tested and White Gold Pearl/Starfire Black. Either way you get gloss black 5-spoke Aggressor wheels with low-profile tyres, a new Smoked Satin chrome finish on many engine and exhaust components, the Speed Screen (headlight cowling) and Chin Spoiler (bellypan), exquisite forward controls from Harley’s Airflow collection, a race-inspired seat with custom badge… the list goes on and on. As a package, it really works. This is one of the best-looking American muscle bikes ever produced – the right silhouette, modern touches, classic lines and incredible attention to detail. All the power in the world isn’t much use if you can’t control it, so Harley-Davidson has added high-performance upside down forks and dual 4-piston caliper brakes. Compared to the standard Breakout, the front wheel is two inches smaller, a 19 instead of 21. This, combined with the USD forks (and unchanged rake at 35 degrees) have driven the trail out to a very long 196mm, which goes a long way to explaining why the CVO Pro Street Breakout wants to understeer heavily at walking pace before stabilising nicely once you’re out of first gear. As speeds rise, the CVO Pro Street Breakout feels better and better, sitting solidly on the road as stable as a rock at highway speeds. Fast sweeping bends are fun on the CVO Breakout, just push on the ’bars and enjoy the lean over before the footpegs touch down. The suspension works OK, better than I expected although it’s no V-Rod. In slower speed corners you’ll scrape the pegs easily and the fat rear tyre doesn’t want to roll over onto its edge, but it’s not scary or anything – just not really what the Breakout is designed for. Just be very careful the first time you do a U-turn. The USD front end gives confidence under brakes, which themselves are powerful thanks to the twin-disc set-up at the front. Harley has been fitting Anti Lock Brakes to most of its bikes for years, and the CVO Breakout is no exception. With its reach-forward drag-style ’bars and forward foot controls, the CVO Pro Street Breakout is good to ride at freeway speeds. You don’t feel like you’re going to get blasted off the back by the wind, but you’re upright enough that the reach to the ’bars doesn’t feel onerous. 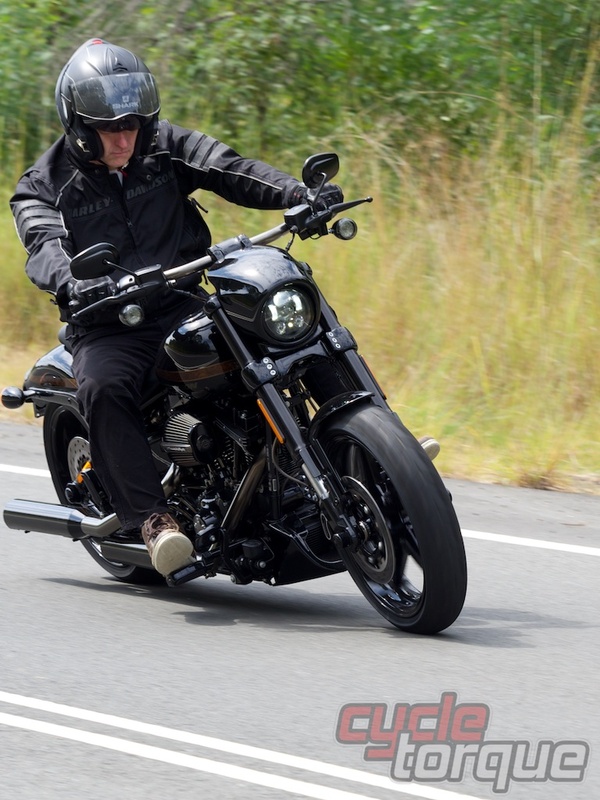 That said, if you’re short and have short arms you mightn’t find the CVO Pro Street Breakout as comfortable as I did, but you won’t have trouble getting your feet on the ground, because the seat height isn’t going to be a problem. Talking of the seat, it’s comfortable and stylish. The pillion perch is quite small and designed for small bums, and is removable of you want to travel solo and show off the beautiful lines of the Breakout. The Screamin’ Eagle motor has incredible grunt right off the bottom of the rev range, with maximum torque reached at just 3500rpm, so you can get to sixth gear pretty quickly and leave it there much of the time. It shakes and vibrates but it’s also balanced, so you know you’re riding a big V-twin without it being too tiring or numbing. At highway speeds the engine is hardly working at all, running at low revs and eating the miles – so much so Harley claims it uses less fuel on the highway than either the standard Breakout or V-Rod muscle, despite also being the heaviest of the three. The difference is marginal to the Breakout, but over 20 per cent better than the V-Rod, and might be down to the cruise control, because if you let the bike manage the throttle it’ll work as efficiently as it can. The cruise control system is easy to use, positioned well for your left thumb to engage, set, resume and change speed. The fuel injection and ride-by-wire systems worked flawlessly during our test, providing excellent feel and response without hunting or playing up. The Harley-Davidson CVO Pro Street Breakout isn’t for everyone. In some ways it is too easy to criticise – too expensive, understeers at low speeds, poor cornering clearance even by cruiser standards… but that misses the point. If you want those things, Harley-Davidson has plenty to offer you, as do a myriad of other manufacturers. What we have here is a beautiful machine which offers excellent performance and kick-arse American attitude, which adds up to an incredible ride, which is much harder to find. The Harley-Davidson CVO Pro Street Breakout will be available in late April priced at an eye-wateringly expensive at $42,495*. That sort of money would buy you Harley’s biggest touring bike, the Ultra, with enough change for a cross-country tour. But that’s not the point. Buying a CVO Pro Street Breakout gives you a custom machine the way the factory’s engineers and designers envisaged it, which makes it pretty special. They haven’t been too concerned about the price, because these limited-edition machines are only produced in small numbers for the people with the passion and budget – they aren’t for everyone. For a similar amount of money you could buy a standard Breakout ($29,750) and build something unique, something very special – but you’d probably struggle to pay for all the engine, suspension and brake work found on the CVO Pro Street Breakout for the difference in the price, and you’d still have a standard Breakout, and while Harleys in general hold their value quite well, you only get a fraction of the money you spend on accessories and modifications back when it’s sold. Buy a CVO and the money is spent up-front and it will retain value based on the whole spend.